Comics Make Me Happy! 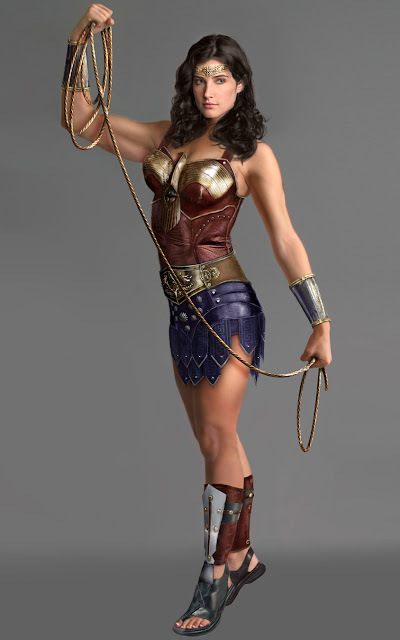 : Fashion Friday: Wonder Woman Photo Manip by "Fan Art Exhibit"
Fashion Friday: Wonder Woman Photo Manip by "Fan Art Exhibit"
Since I'm kind of run down, I'll just post some pretty pictures. Do you like this version of Wonder Woman's costume? I found it online looking for, ironically, some Smallville Hawkgirl photos in anticipation of the upcoming episode. (The artist has done his own version of Hawkgirl as well.) They are photo manipulations by Fan Art Exhibit. I kinda like it. I'm not too sold on the sandals. But I wouldn't mind seeing this on the Silver Screen, if ever a Wonder Woman live action movie is made. The bodice and eagle chestpiece look nice, and I like the blue leather skirt with the Greek pattern (look closely) and the studs. Wonder Woman, on her way to do some spear fishing. There's a really awesome one here, and a close up here, but it doesn't look like the author wanted them reposted, so I'm only providing a link. But go check them out! And take a look at the Huntress and Hawkgirl while your'e there, too! Is that...Jennifer Connelly? Great choice! It looks quite nice, faithfull, yet adapting elements. And the Hawkgirl.. Just saw it. From Hawkman look on Smallville..she might actually sort of come like that. Yuck! 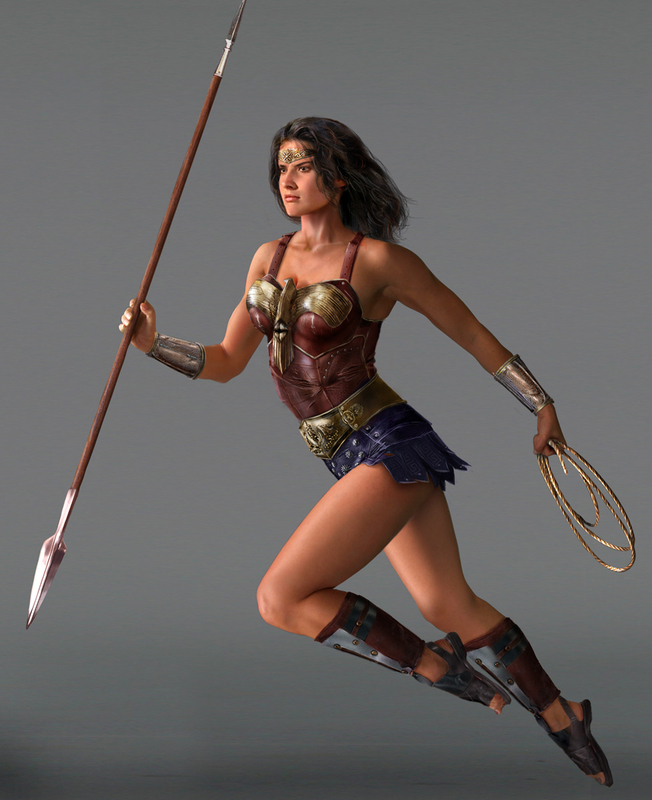 What the hell has Wonder Woman been doing for her inner thighs to be covered in scratches? Why not just make a Xena movie? The only one that works for me is Hawkgirl. I like it! The skirt especially reminds me of Darwyn Cooke's version. I'm not sure if it's Jennifer Connolley, Eyz. I think the artist mentioned something about Colbie Smulders (I don't know who that is) here. But she bears a striking resemblance. As long as Shayera has nth metal wings instead of real feathers on Smallville, I'll be happy. Hawks shouldn't be plucked for their feathers! It does remind me of the Darwyn Cooke version, Sally! That's why i kinda like it. It looks kine of old-fashioned, too. I'm open to reinterpretation, but I don't understand why with Wonder Woman she's always treated as a throwback. So the amazons lounged around Paradise Islands in togas. They're comfy like pajamas. When it's time to fight in the 21st century, can we please cover our legs, lose the f'n spears, and employ some Amazonian super-science. Damn Perez for brainwashing a generation into treating Amazon culture like they're the Ancient Greek equivalent of the Amish! You can probably blame the Lynda Carter show for a lot of those perceptions, too. Don't get too mad, but, Amazons have super-science? I thought most of their society was magic-based. But I claim ignorance when it comes to all things Amazonian, so don't go by me. Someday, I'll get around to reading some WW stories. I'd trade leg coverings for straps holding up that outfit anyday. Bare legs may be impractical in battle, but strapless tops border on the awkward in just everyday situations. Otherwise, Diana's gotta have a whole drawer full of fashion tape. LOVE the straps! The only part i'm not keen on is the boots. Gladiator sandals are crap in real life and don't look any better on a fictional character. About the Amazons and science, they do have a pretty good knowledge of science. There's the purple healing ray for one, which has been acknowledged in text as being sceintific in nature, not magical. Their doctoring has certainly progressed far more than that of 'man's world' and I don't think they use operations to heal people. The Bana Mighdall (seperatist tribe) are also very much into technology. They still seem pretty magic-based, most of the times. "As long as Shayera has nth metal wings instead of real feathers on Smallville, I'll be happy. Hawks shouldn't be plucked for their feathers!" Yeah, I'd prefer their wings a bit metal-colored. No need for huge metalic clumsy wings either! Just a different feel/look/color. Liss, the Pre-Crisis Amazons kept abreast of all human development through advanced viewing screens. They were able to incorporate technological breakthroughs from around the world into their own work. Aesthetically, their inventions remained Greco-Roman in appearance, but they actually fall under the category of "so advanced as to appear as magic." Wonder Woman controlled her Invisible Plane telepathically through her tiara, and injuries miraculously healed without surgery under the Purple Ray. The Amazons beat Man's World into space, donchaknow?